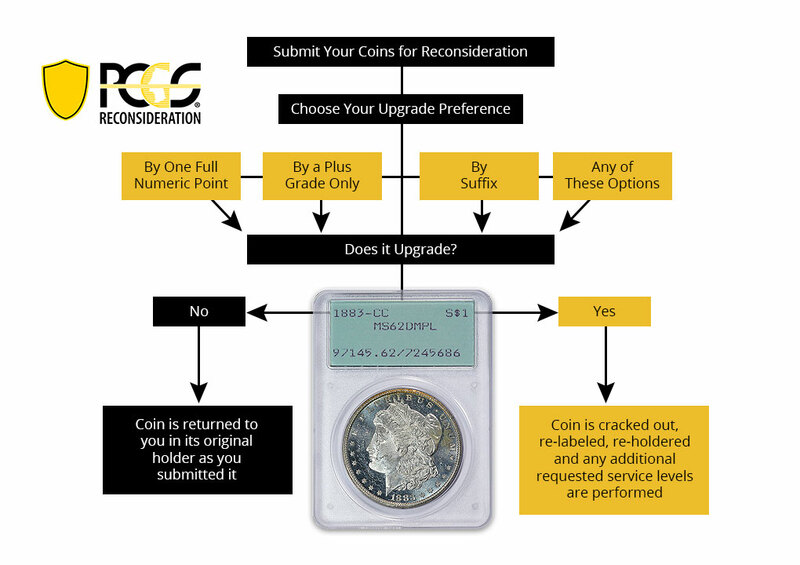 RECONSIDERATION™ is a service from PCGS that allows you to submit your coins for regrading without the risk of a potential crack out if the coin does not receive an upgrade. What coins are eligible for PCGS Reconsideration? Any coin currently inside a PCGS holder is eligible for PCGS Reconsideration, including any color label, any year, and any type of coin. Why should I use PCGS Reconsideration? This program is a win-win for collectors. You keep your original holder if your coin doesn’t upgrade; if it does upgrade, your coin receives a higher grade and fresh labeling. What are the fees associated with the Reconsideration program? If your coin upgrades, you will be charged an additional 1% of the final value of the coin in its final grade, this is referred to as the Guarantee Premium (the GP 1% would be in addition to the basic service level you select). If your coin does not upgrade, you will be charged the simple basic service level fee and any other fees applicable to your submission. Will you return my original label to me if my coin upgrades? If your coin upgrades, we will not return your original PCGS label to you. This is for population reporting reasons so we can keep accurate information in our database. Why is PCGS offering Reconsideration? You asked for it and we delivered. Listening to your feedback and considering the process, we developed a process to allow Reconsideration. Will anything change on my label if I receive an upgrade? Other than the grade itself, anything on the original label will stay the same, including pedigree, descriptions and certification numbers. Note that if your coin qualifies for the selection you chose, you will lose your third party sticker service, such as Wings, Eagle Eye and CAC. How do I choose Reconsideration on the Submission form? There is a ‘Reconsideration’ check box in the ‘Type of Submission’ section of the submission form. Check this box to designate Reconsideration as your submission type. Please also specify which Reconsideration option you would like to apply to your entire submission (only one option per submission). As with any PCGS submission: you cannot mix reconsiderations with raw, regrades or crossovers. How is the 1% Guarantee Premium calculated? The PCGS 1% Guarantee Premium is based off the final grade of the coin according to the PCGS Price Guide. If there is no PCGS Price Guide value, the 1% is based off the Declared Value of the coin as stipulated on the submission form. 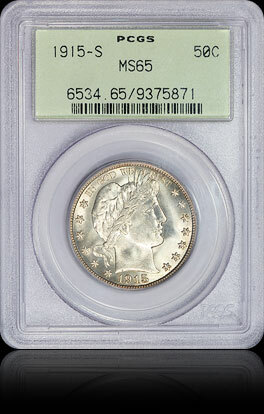 Note, however, that PCGS reserves final discretion on the value of the coin. This may result in the fees you have calculated on the submission form being adjusted to best reflect the value of the coins submitted. For this reason, it is best to pay by credit card in the event that your fees are adjusted. Where can I submit for Reconsideration? Currently, Reconsideration is only available through PCGS US offices. We do also accept Reconsiderations during on-site grading as part of our U.S. show schedule.